The U.S. Securities and Exchange Commission on Tuesday filed suit against Rio Tinto and two of its former top executives claiming they misled investors over the value of coal assets in Mozambique obtained in an acquisition gone bad that created huge losses for the worldwide mining giant. Rio Tinto continued valuing the Mozambique mining assets at over $3 billion despite internal assessments that were each a negative $680 million, shows court documents that were filed in federal court in Manhattan. The lawsuit by the SEC alleges former CEO Thomas Albanese and former CFO Guy Elliott were aware of the rapidly dropping value of the project but did not disclose that to investors and misled the board of directors over the scope of those problems, said the SEC. The SEC in the suit is pursuing civil penalties and disgorgement of gains that were ill-gotten through its suit, and seeks to bar Albanese and Elliott from being officers and or directors of any public company. 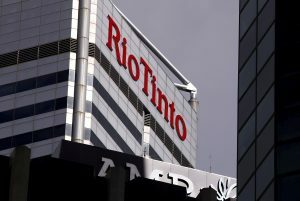 The investigation by the regulator started in 2013 disclosed Rio Tinto this past Decembers, when the company said it has been cooperating with the federal agency’s probe. On Tuesday, Rio Tinto announced that the fraud claims by the SEC were unwarranted and they would prove that in court. Albanese said that he was innocent of wrongdoing and that the claims by the SEC will be proved to be baseless. An Elliott spokesperson said he disputed the charges by the SEC and would fight them. In a separate issue, Rio Tinto settled claims by the Financial Conduct Authority in the UK that it did not write down the Mozambique mine’s value in a timely fashion. The action by the regulator did not find Rio Tinto committed any fraud, said the company through a release to the press. Albanese resigned in 2013 as the company said it would be writing off over $14 billion value of different assets, including coal operations in Mozambique that it has acquired during 2011 through a takeover of Riverside Mining for $3.7 billion. The figure of $14 billion included a big impairment that was recognized on the value of aluminum processing business Alcan Inc. that was acquired by Rio Tinto in 2017. The SEC has alleged that both Albanese and Elliott were aware of problems with the assets in Mozambique but did not disclose them because they already wrote down the Alcan value and were worried over the reaction of the market to another deal gone bad.